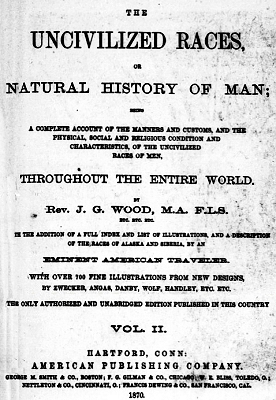 John Wood : The Uncivilized Races, 1868-1883. The amusements of the Tahitans are much like those of other Polynesians, and therefore need but little description.
" Neither were they strangers to the soothing effects produced by particular sorts of motion, which in some cases seem to allay any perturbation of mind with as much success as music. with such eagerness on each side, as to command all my attention.
" At first I imagined that he had stolen something from one of the ships, and was pursued, but on waiting patiently saw him repeat his amusement. before it with great quickness till he found that it overtook him, and had acquired sufficient force to carry his canoe before it without passing underneath. 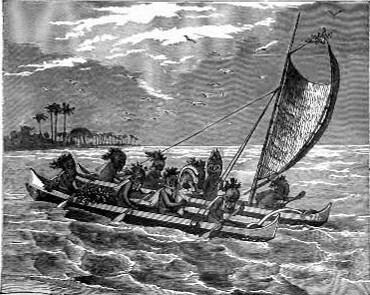 He then sat motionless, and was carried along at the same swifl rate as the wave, till it landed him upon the beach, when he started out, emptied his canoe, and went in search of another swell. "I could not help concluding that this man felt the most supreme pleasure while he was driven on so fast and so smoothly by the sea, especially as, though the tents and ships were so near, he did not seem in the least to envy, or even to take any notice of the crowds of his countrymen collected to view them as objects which were rare and curious." ... which the Sandwich Islanders amuse themselves. This is practised in several of the islands of Polynesia, but in none is it carried out to such perfection as in the Sandwich group.
" Swimming is not only a necessary art, in which both the men and women are more expert than any people we had hitherto seen, but a favorite diversion amongst them. ''The surf, which breaks on the coast round the bay, extends to the distance of about one hundred and fifty yards from the shore, within which space the surges of the sea, accumulated from the shallowness of the water, are dashed against the beach with prodigious violence.
" 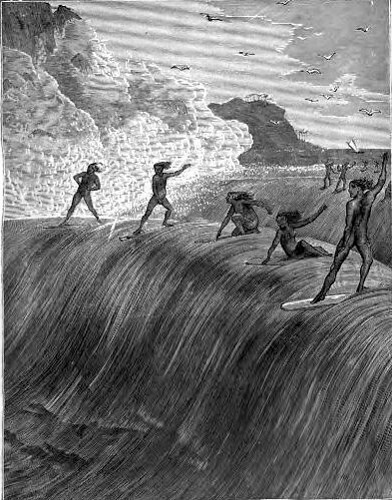 Twenty or thirty of the natives, taking each a long narrow board, rounded at the ends, set out together from the shore. 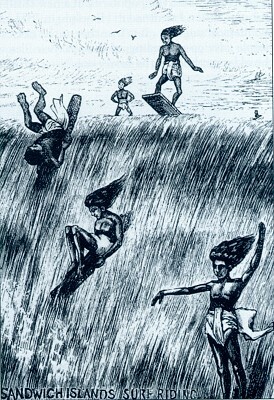 The first wave they meet they plunge under, and, suflfering it to roll over them, rise again beyond it, and make the best of their way by swimming out into the sea. shore, the rest breaking in the intermediate space, their first object is to place themselves on the summit of the largest surge, by which they are driven along with amazing rapidity toward the shore. The coast being guarded by a chain of rocks, with here and there a small opening between them, they are obliged to steer their board through one of these, or, in case of failure, to quit it before they reach the rocks, and, plunging under the wave, make the best of their way back again. This is reckoned verv disgraceful, and is also attended with the loss of the board, which I have often seen, with great terror, dashed to pieces at the verv moment the islander quitted it. The boldness and address with which we saw them perform these difficult and dangerous manoeuvres was altogether astonishing, and is scarcely to be credited." These swimmers used often to pass nearly a mile seaward, in order to enjoy the rapid motion of their return as long as possible. Both sexes and all ranks unite in it, and even the very chiefs themselves, who have attained to the corpulency which they so much admire, join in the game of surf-swimming with the meanest of their subjects. Some of the performers attain to a wonderful degree or skill, and, not content with lying on the board, sit, kneel, and even stand on it as they are hurled shoreward by the giant waves. They are slightly convex on both sides, and are kept very smooth all surf-swimmers cherishing a pride in the condition of their boards, and taking care to keep them well polished and continually rubbed with cocoa-nut oil. The artist has finely represented on the following page the marvellous conquest of the sea by tnese islanders. A Sandwich Island child can swim as soon as it can walk, if not sooner, the mothers taking them from the breast, laying them on the surface of the water and encouraging them to kick about as if lying on their mats ashore. One writer mentions his encounter with an object which he took to be a very large frog, but which turned out to be a Kanaka (Sandwich Island) baby, which was l^nff on its back and disporting itself quite at its ease. Indeed, in the mind of a Sandwich Islander there seems to be no connection between the ideas of water and danger, neither does it enter his imagination that any human being is unable to swim. the presence of the natives, simply because the idea that any one could be endangered by falling into the water never occurred to them. ... their canoes, and have a curious mode of extracting amusement out of them. A number of men will sometimes paddle a canoe after dressing themselves up m a most ludicrous fashion. They take large empty gourds, and put them over their heads, atter cutting holes in them corresponding with the eyes and nose, so that the effect is not at air unlike that of a turnip lantern. To the upper part of the gourd is attached a bunch of slender green twigs, which look at a little distance like a plume of feathers, and to the lower part are suspended a number of narrow strips of cloth, looking like a long beard. In every case where these masks were worn, the wearers seemed exceedingly jovial, laughing, shouting, and playing all kinds of antics. It was suggested that these masks were in fact helmets, used to protect the wearers against the stones slung by their adversaries; but the whole demeanor of those who wore them was so completely that of mere masqueraders that the helmet theory seems quite untenable. 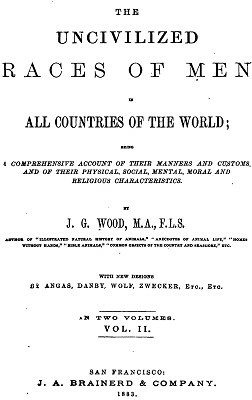 Geoff Cater (2006-2013) : John Wood : Uncivilised Races, 1883.